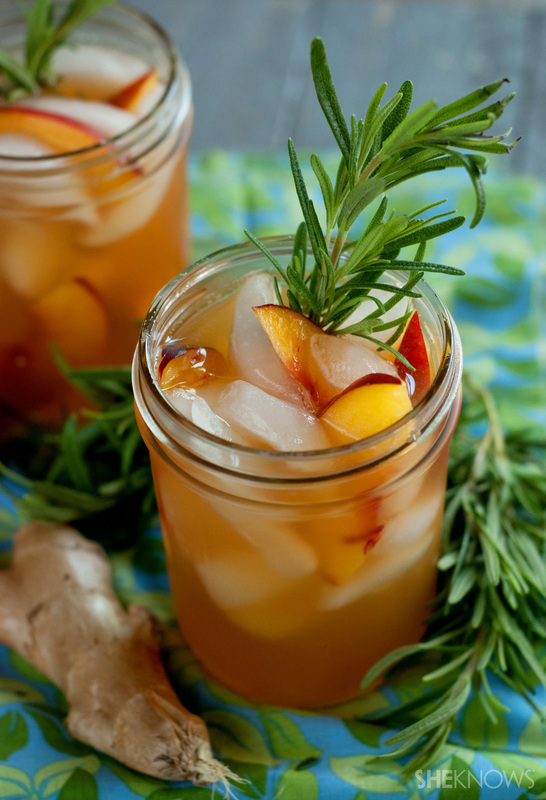 Iced tea gets a total makeover in this peach green tea spiked with fresh rosemary and sweetened with homemade ginger syrup. Sure, iced tea is delicious, but why not transform a basic sweetened tea into something magical, flavorful and exciting? In this drink, not only did I use peach green tea, which you can find at your local health food store, but also fresh peaches to intensify the taste. Don’t be scared by the rosemary in this drink; it adds a hint of woodsy flavor, while the homemade ginger syrup gives it a sweet spiciness. To a pitcher, add the tea bags and fresh rosemary. Carefully pour the boiling water over the top, and allow the tea to steep for 6 to 8 minutes, depending on the strength of flavor you desire. Remove the tea bags and rosemary, and allow the tea to cool. Divide the fresh peaches among glasses. Using a muddler, gently muddle the peaches to break them up and release their juices. 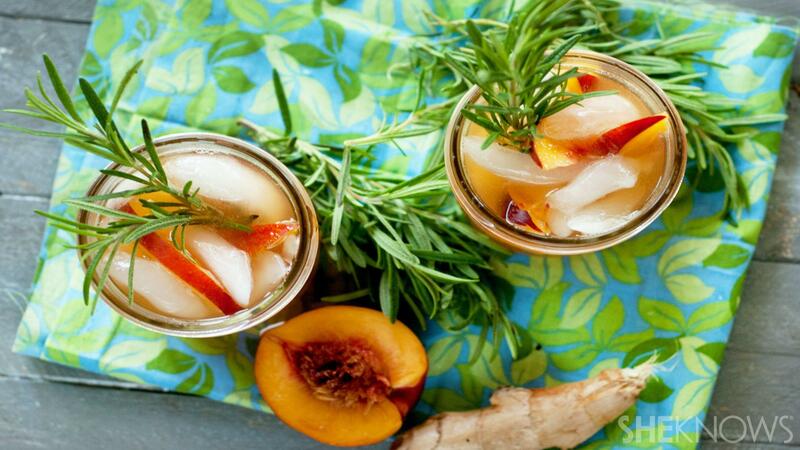 Pour the cooled tea over the tops of the peaches, and sweeten each glass of tea with the ginger syrup (recipe below). Add ice, and mix well. Garnish with extra rosemary, if desired, and serve immediately. To a small pot over high heat, add all the ingredients, and bring them to a boil. Reduce the heat to medium, and allow to simmer uncovered until the sugar has melted and the syrup is slightly thick. Remove from the heat, and allow the syrup to cool. Pour the syrup into a glass jar, and store it in a dark, cool place.